für das neue Jahr wünsche ich mir mehr Struktur! Nicht nur für Deine Frisur sondern auch für meinen Salon. Darüber hinaus erwartet Dich ab 2016 eine transparente Preisliste, spezialisierte Mitarbeiter und mehr Öffnungszeiten. 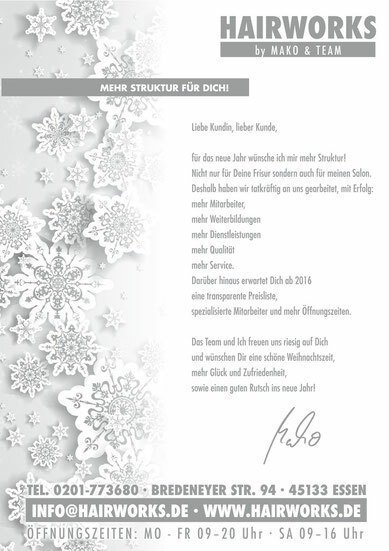 Das Team und ich freuen uns riesig auf Dich und wünschen Dir eine schöne Weihnachtszeit, mehr Glück und Zufriedenheit, sowie einen guten Rusch ins neue Jahr !!! What's up i am kavin, its my first time to commenting anywhere, when i read this piece of writing i thought i could also make comment due to this good article. Having read this I believed it was extremely enlightening. I appreciate you finding the time and effort to put this short article together. I once again find myself spending a significant amount of time both reading and posting comments. But so what, it was still worthwhile! I have been exploring for a little bit for any high-quality articles or blog posts in this sort of house . Exploring in Yahoo I at last stumbled upon this website. Studying this info So i'm glad to convey that I've an incredibly just right uncanny feeling I found out just what I needed. I so much undoubtedly will make sure to do not fail to remember this web site and give it a glance regularly. Its like you read my mind! You appear to know so much about this, like you wrote the book in it or something. I think that you can do with some pics to drive the message home a bit, but other than that, this is wonderful blog. A fantastic read. I'll certainly be back.